The background of this master’s degree thesis was from a Tekes funded project named “Service Innovation through Strategic Stakeholder Integration” (SISSI). SISSI is a joint project undertaken by Laurea University of Applied Sciences in cooperation with Hanken School of Economics, Finland. In addition, there are two case companies as main partners in SISSI project. The topic of this thesis was inspired by the definition of service design as presented by Selgelström. The definition says service design is “the use of designerly way of searching for solutions to problems in people-intensive service systems through the engagement of stakeholders” (Segelström 2010, 16). A rhetorical question of “how stakeholders can be engaged” came up on the mind of the author of this thesis. As a result, the academic journey on this thesis then began. Stakeholder engagement can be defined as the effort or action an organisation undertakes towards understanding and involving stakeholders “and their concerns in its activities and decision making processes” (Partridge, Jackson, Wheeler & Zohar 2005, 6). A quality stakeholder engagement process has the potential to address complex problems in both private and public sector’s service design and delivery (REVIT, 2007). The literature review of this thesis covered topics such as service, service dominant logic, service design processes and tools, value co-creation, stakeholders, and stakeholder engagements. Some relevant conclusions and speculations from the perspective of this author were also presented in the literature review. In addition, some gaps were identified in the reviewed literature (see thesis report). The aim of this thesis was to contribute to the body of knowledge that explores the role of effective stakeholder engagement using service design as a context. Firstly, its contributions included the development of a process model which integrates a standard stakeholder engagement framework with service design process. This process model aimed to facilitate better insight towards engaging stakeholders in the designing of a service. Secondly, it aimed to introduce the stakeholder engagement framework to interested organization for the purpose of benchmarking in their other stakeholder engagement activities. Consequently, beyond service designing, businesses and organisations can as well use this process model as a guide to address other issues that entail stakeholder engagement. The possibility of using the process model for other stakeholder engagement purposes made it transferable and applicable for use in other contexts. Thirdly, the concept of co-creation was considered as one of the specific activities that can take place under the larger umbrella of stakeholder engagement. Co-creation implies collaboration towards value creation by sharing inventive ideas, design concepts and other relevant considerations (Ostrom et al. 2010). In considering the connection between co-creation and stakeholder engagement, an effort was made to assess the co-creation approach of the partner company that was studied. The partner company and five of its business-to-business customers were used as the case studies in this thesis. The research methods that were used in this study were interviews, observations and benchmarking. The service that was studied was waste management service. Interviews: the interviews were specifically used to collect data that were analysed to determine the current state of the co-creation approach of the partner company with its case companies. Three project members also helped with the collection of some interview data. On the other hand, some general background information concerning the needs of the partner company came from the interviews. The interview sessions also made it possible for the interviewees or stakeholders to contribute to the stakeholder map that was developed for the partner company. Observation: the observation aspect of this study was helpful in the development of the service blueprint. Observation also provided additional background information on the service that was studied. Benchmarking: the benchmarking aspect of this study was useful in the identification of the standard stakeholder engagement framework that was explored and proposed as part of the process model. 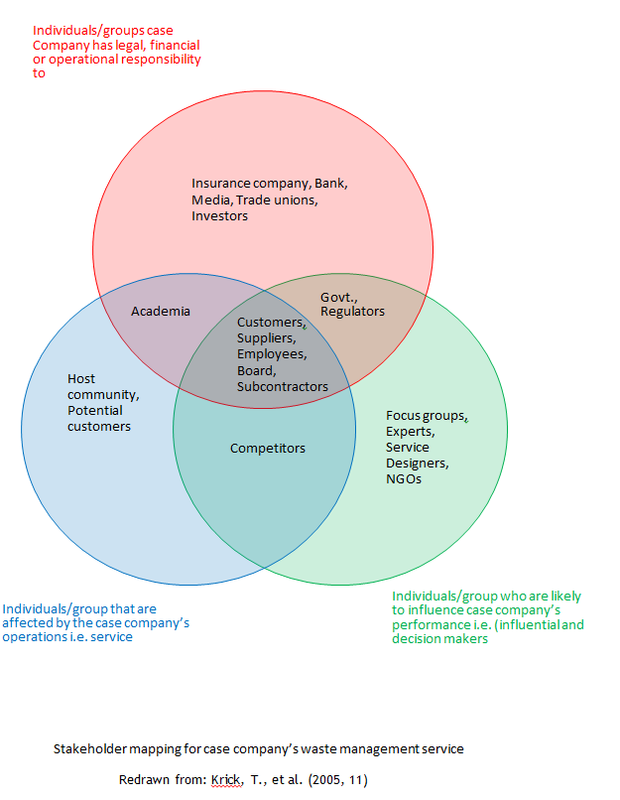 RQ 1: How to identify stakeholders to be engaged in the design of a service and who are the stakeholders? Answer: the first research question was addressed through the application of stakeholder map as provided in the stakeholder engagement framework. RQ 2: What is the current state of the co-creation approach of the partner company with its case companies? Answer: this was answered by testing and using a service design tool called co-creation tool. The result revealed that the current co-creation approach of the partner company was average. It was found to be in the middle of the co-creation continuum. This result was presented as a co-creation tree (see thesis report). There were other co-creation tree results from the five case companies. The results of the five case companies were summarized by testing a new quantitative approach. The study revealed that customer interactions & relationships were the most co-created activity between the partner company and its case companies. This was followed by strategic thinking and business model. Service design was found to be the least co-created activity in the approach of the partner company among the three themes of co-creation tool. Some suggestions towards improvement were also recommended to the case company from the result of the co-creation tool. RQ 3: How to engage the stakeholders in designing a service? 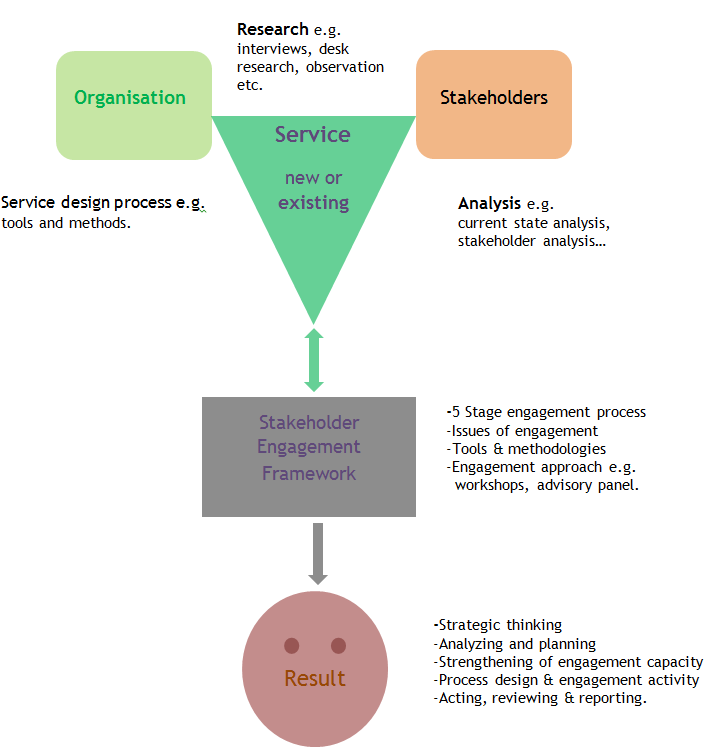 Answer: I aimed to answer the third research question by describing and exploring the five stage stakeholder engagement framework using service design as the issue of engagement (see the figure below). The engagement framework included many useful tools and templates that can help in gaining deeper insights into stakeholders’ related matter, issues of engagements, engagement objectives etc. My plan was not to entirely carry out the process of stakeholder engagement in practical terms. I couldn’t have carried out the stakeholder engagement as an individual or a thesis student. This was impossible during the time of this study because of the requirements of stakeholder engagement and the limitation of the scope of this thesis. For instance, proper arrangement should be in place concerning the preparedness and cooperation of the engaging organisation and its stakeholders in order to carry out practical engagement. The idea was to explore the guidelines provided in the manuals of the engagement framework using service design as a context as much as possible. I was able to explore and acquaint myself with the processes and tools in the engagement framework in order to be able to share what I have learnt with others e.g. organisations and individuals. The key outputs under each of the five stages of the stakeholder engagement framework were the managerial implications of its application by interested businesses and organisations. The service blueprint was used to explore the service touchpoints and customer journey of partner company’s energy waste management. This blueprint identified some flaws in the delivery of the service. The flaw or problem areas along the service path were highlighted in red colour boxes, and they required some improvement. In addition, the boxes highlighted in yellow colour indicated new ideas that could be applied to find a solution to or address these problem areas (see blueprint in thesis attachment). The recommendations I made to the partner company towards the improvement of their service were found interesting and useful to them (see thesis report). The figure below represented the proposed process model that was the goal of this study. The process model integrated and highlighted the relationship that existed between an organisation and its stakeholders. In the figure a “new or an existing service” represented the issue of engagement upon which an organisation and its stakeholders shared mutual interest. This process model also included the research methods that could help in getting deeper insight into the service, the concerned organisation and its stakeholders. Some of the relevant research methods in this process model were interviews, observation, and benchmarking. Service design process and tools were useful in the service design aspects. 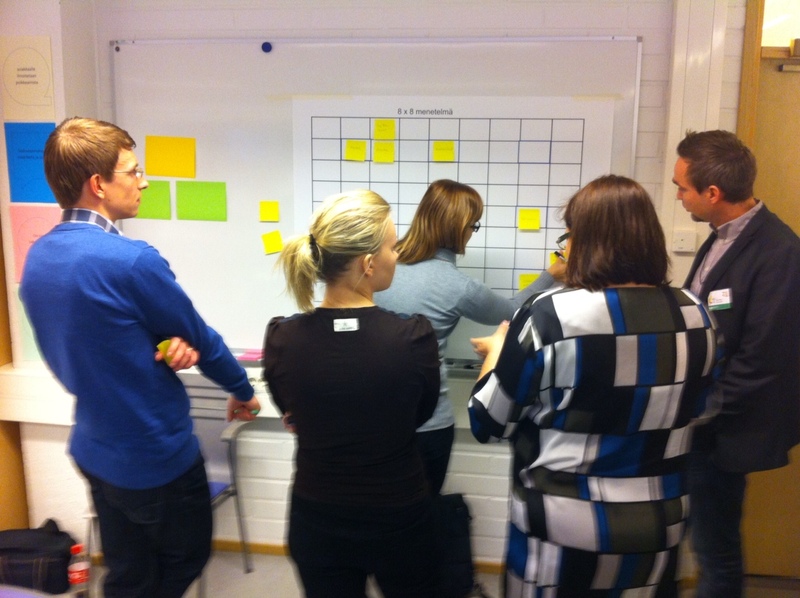 Service blueprint and co-creation tool were part of the useful service design tools in this process model. This did not suggest that these two tools were the only relevant service design tools in this context. The current state of the organisation with its stakeholders in terms of co-creation approaches could be analysed and determined with co-creation tool. The determination of the current state of an organisation’s co-creation approach with its stakeholder is more relevant with an existing service. The overall stakeholder engagement objectives of the organisation with respect to service design or other activities could be enhanced with the application of the stakeholder engagement framework. The engagement framework also included many useful tools and methodologies. 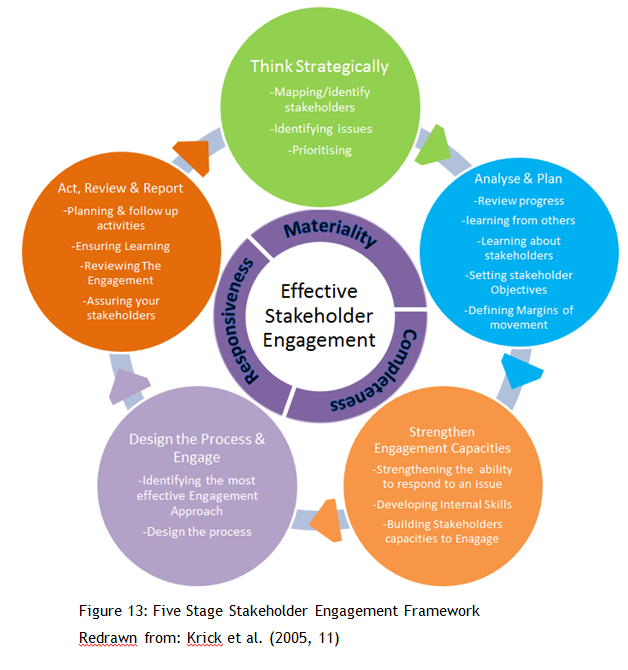 The application of this framework in the engagement of stakeholders could be useful in five areas concerning stakeholder engagement. These areas are: (1) Strategic thinking (2) analysis and planning (3) strengthening of engagement capacity (4) process design & engagement activity (5) acting, reviewing and reporting (managerial implications). In conclusion, the importance and usefulness of stakeholder engagement to businesses and organisations cannot be overemphasised. Stakeholder engagement has been discovered to have the capacity of engendering preventive ways of addressing organisational challenges beyond being a reactionary mechanism. Its preventive approach of addressing future problems includes systematic way of identifying and managing risks. A good understanding of an organisation’s stakeholders often generates a more progressive operating environment. Strategic and operational performances of organisations have been improved through stakeholder engagement. Stakeholder engagement also serves as a veritable source of remarkable innovations and partnerships (AccountAbility 2008, 8).